Wenphil Corp. President and COO Michael Christian Kho (left) and COO Jay Alcantara (right) together with SM City Baliwag Mall Manager Andrew Cristobal (2nd from right) led the grand opening of Wendy’s SM City Baliwag. Joining the honors are Baliwag Mayor Ferdinand Estrella (4th from right), Councilor Joel Pascual (3rd from right) with special guests Letty Mapoy, Demetrio Bajet and Agustina Pancho. 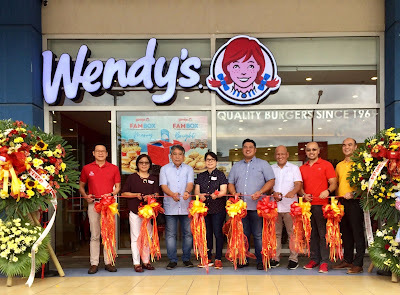 The famous taste loved by generations of Filipinos is now a few steps away to Bulakenyos as Wendy’s — the home of “Old Fashioned Hamburgers” finally made its way to SM City Baliwag. Known to bring only the real and fresh dining experience, Wendy’s welcome everyone into their store’s modern look perfect for group of family and friends. More so, the brightly colored interiors creates an enticing ambience that adds joy to the much-anticipated menus the store has to offer. To spin off the holiday, Wendy’s bring in the real deal with the maple chicken croissant that combines the sweet and salty taste in one bite. Of course, their signature burgers is total knockout when it comes to tickling the taste buds of every foodie—bacon mushroom melt, cheeseburger deluxe, among many others. Name it, they have. There comes their tasteful salads for health buffs- garden mix salad, caesar salad, chunky chicken salad and macaroni side salad. The long wait is certainly over! Wendy’s is now open to serve real delicious deals to Bulakenyos. Visit them now at the Ground Level, Mall Atrium of SM City Baliwag. Moreover, who would dare to resist their classic frosty, a soft-served enjoyed by millions of Wendy’s fans everywhere. When in search for more options to satisfy your craving, you’ll never go wrong with some of their yummy treats - the waffle cut fries or Baked Potato with Cheese & Bacon. Alas! Don’t miss their biggie Iced tea that comes in new refreshing flavors. Wendy’s also offer rice meals options for the hungry bunch such as Soy Garlic Chicken, Crunchy Spring Rolls and Salisbury Steak. There is more to these mouthwatering menus awaiting at the newly opened Wendy’s located at the Ground Level, Mall Atrium of SM City Baliwag. Come bring the squad, relive the classic taste and let the delicious happen today at Wendy’s SM City Baliwag.